Phablet phans, rejoice: new rumors suggest the Samsung Galaxy Note 8 could be a huge upgrade when it arrives, with a 4K screen and improved VR skills being among the highlights. A 4K resolution, even on the larger screens found on phablets, is unlikely to look much sharper than a QHD one when viewed normally. However through a VR headset where the screen is right up against your eyes, that resolution boost makes a huge difference. Coupled with the launch of a new Gear VR headset this could make for the best mobile VR experience yet - as long as it stays flame free. 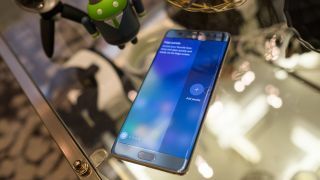 And that’s not all the Galaxy Note 8 is said to offer, as the source adds an improved stylus features and a more secure iris scanner will also be included, along with the new AI assistant that’s said to be making its debut on the Samsung Galaxy S8. Of course, all of this is just rumor for now, but it would make sense for Samsung to pack the Galaxy Note 8 full of improvements, as the company is going to want to do everything it can to banish the memory of the Galaxy Note 7. It’s still possible that Samsung will kill the Note brand altogether, but the specificity of this leak shows the brand is still considering creating a new Note. We're not expecting Samsung to launch the new phone any earlier than usual, with the Note 8 launch still coming in the second half of 2017 – likely around a year after the Note 7, in August or September.